As we reported yesterday, the Lyndhurst Estate in Tarrytown, New York is running a month of special Dark Shadows-themed tours. The historic property was used as a location in both 1970s Dark Shadows feature films. Actress Lara Parker (Angelique) has made a very special donation for the event, and has given the estate a full-size replica of her portrait from Night of Dark Shadows. Lara received the canvas as a gift after filming wrapped in 1971 and still has it after 40 years. The portrait can be seen at Lyndhurst throughout October, along with other Dark Shadows exhibits. For tour details, visit Lyndhurst's official website. Both original Dark Shadows movies will be released on Blu-Ray and DVD for the first time later this month. For more information and to order online, click here. 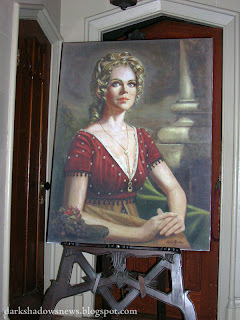 I always loved this portrait in the movie Night Of Dark Shadows as well as the one in Angelique's Room on the Abc Tv Series Dark Shadows in the 1970 Parallel Time part of the series. Was wondering has Ms. Lara Parker ever thought of making poster size copies of the two portraits and sign them and sell them to us fans? It would be a awesome to buy not only for me but for other fans of not only her but of the Orginial Dark Shadows Television Show. I hope you can pass the suggestion to her and let us know what she has to say about the idea? Beautiful and stunning portrait of Actress Lara Parker as the very clever & wicked ANGELIQUE. Lovely lady: she has the most amazing eyes on this here Earth! Win The Dark Shadows Movie On Blu-Ray!